Launch of 485 schemes and services through Antyodaya Saral Portal developed on Service Plus platform of NIC HQ. 71 Antyodaya Saral Kendras: where schemes and services both are offered and situated at subdivision & tehsil levels. Antyodaya Saral Helpline: A 50 seater helpline (1800-2000-023) has been setup for citizen’s queries and issues w.r.t. to schemes and services related queries and problems being faced by them on service delivery. Antyodaya Saral Public Dashboard portal: A public dashboard portal has been launched for citizen to know the performance of departments, districts and services which is based on RTS (Right to Service) timeline. 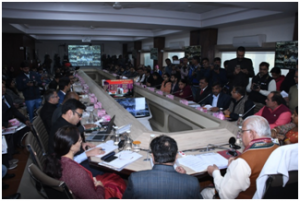 Antyodaya Saral is a vision of Hon’ble Chief Minister Haryana to “FUNDAMENTALLY TRANSFORMING CITIZEN SERVICES & SCHEMES DELIVERY” from citizen as well as government official’s perspective. The purpose of this project was to bridge the government citizen interaction gap using technology as a lever and introduce transparency in the system. Also from a citizen’s perspective the whole experience of applying for a service should be very streamlined and uniform across all the departments of the state and across all government touch points as well. This a big shift in the way citizens will interact with the government. 485 schemes and services spanning across 37 departments, boards and corporations are being offered on this portaland aiming to complete all 550+ G2C services & schemes and are available across the newly revamped state of the art 115 touch points across the state which are termed as Saral Kendra, Antyodaya Kendra and Antyodaya Saral Kendra. All launched services have been bring under Right to Service Act (RTSA). The portal was developed on ‘Service Plus’ Platform of NIC HQ, hosted at Meghraj Cloud and open stack has been used. 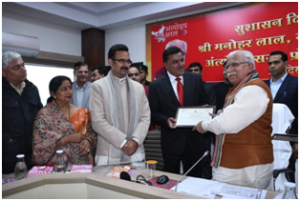 Chief Minister Haryana especially highlighted the huge saving of Government Funds as the entire project was done in-house at a nominal cost of Rs. 4 Crores as against an earlier cost estimated at Rs. 250 Crores if done through external vendor.